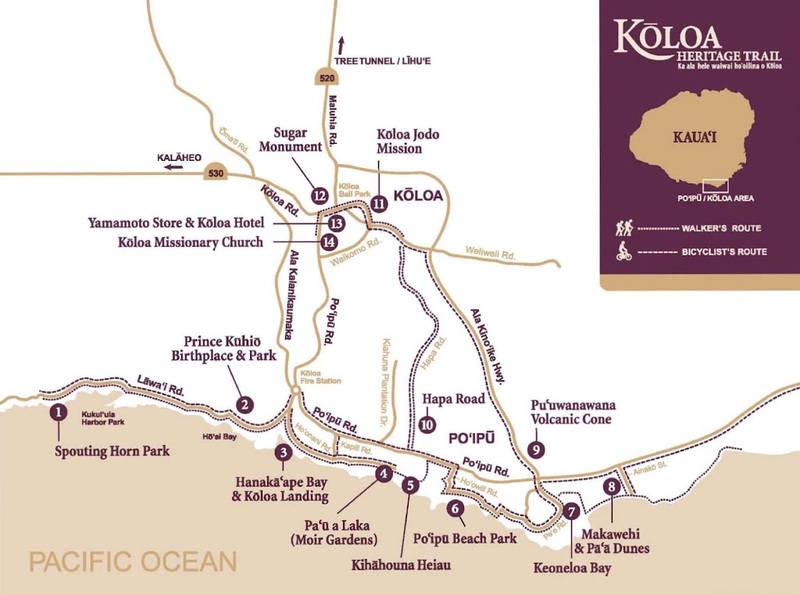 “The history of Koloa is in many ways Hawai‘i’s history in microcosm.” (Wilcox) The focus of interest is the region‘s history and the role this area played in helping to shape Hawaiʻi‘s socio-economic past, present and future. The South Shore of the island of Kauai has many scenic, natural and recreational qualities that travelers may experience and enjoy. Along the coastal area of Poʻipu there are popular beaches for swimming, surfing, snorkeling, scuba or sunset watching. You enter the historic Old Koloa Town and Poʻipu Beach, Kaua‘i’s premier resort destination, through a tree-formed tunnel. The native Hawaiian history, archaeology and culture can be seen throughout the area and are the foundation of the historic events that followed. 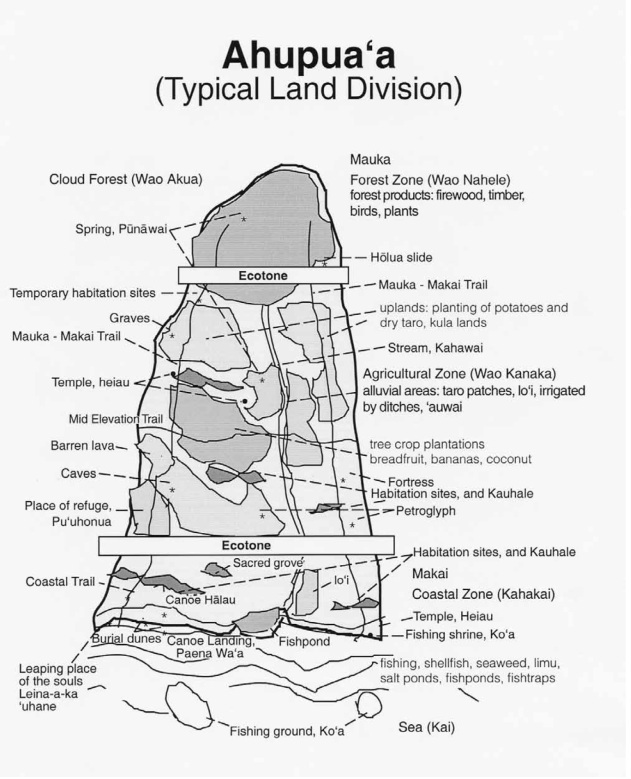 Scattered throughout the area are remnants of pre-contact ancient Hawaiʻi life in the forms of heiau (Hawaiian temples) the Koloa Field System (agricultural) and culturally-significant natural geologic features in the forms of peaks, hills, streams, caves, bays and coastal features. The native Hawaiians along the Koloa shore were the first to see the white man in Hawaiʻi. It was in 1778, along Kaua‘i’s South Shore, that Captain James Cook first traveled, landed and made “contact”, introducing Hawaiʻi to the rest of the world. His arrival was the beginning of multiple changes in Hawai‘i’s socio-economic framework. Koloa Landing at Hanakaʻape Bay (the Kingdom’s first Royal Port of Entry) became the favored and major port of call on the island – because of the ability to maneuver in and out of the anchorage – whatever the wind direction, and the region had ample water and food crops to provision the ships. This led to a series of economic activities that shaped the history of the islands. One of the first exports from Hawaiʻi was sandalwood trees that grew throughout the islands; exported primarily to China. Sandalwood was a desirable cash crop in Hawaiʻi because it could be harvested year round and did not have to be irrigated or cultivated. Starting in 1790, trade in Hawaiian sandalwood became an important export item. As trade and shipping brought Hawaiʻi into contact with a wider world, it also enabled the acquisition of Western goods, including arms and ammunition, by the Hawaiian leaders. However, by 1830, the trade in sandalwood had completely collapsed for two reasons: Hawaiian forests were exhausted and sandalwood from other areas drove down the price in China which made the Hawaiian trade unprofitable. On October 23, 1819, the first group of missionaries from the northeastern United States set sail on the Thaddeus for the Sandwich Islands (now known as Hawai‘i.) There were seven couples sent by the American Board of Commissioners for Foreign Missions to convert the Hawaiians to Christianity. With them were four Hawaiian youths who had been students at the Foreign Mission School, including Prince Humehume (son of Kauai’s King Kaumuali‘i.) In modern times, three churches on Poʻipu Road all trace their roots to the same Christian denomination – Congregational. Hawai‘i’s whaling era began in 1819 and replaced the sandalwood trade. At that time, whale oil was used for heating, lamps and in industrial machinery; whale bone was used in corsets, skirt hoops, umbrellas and buggy whips. Whalers, seeking water and food supplies, called at Koloa Landing, the Island’s foremost port. Koloa was a center for agriculture and, as such, became the center of activity for Kauai. The whaling industry was the mainstay of the islands’ economy for about 40 years. Sugar gradually replaced sandalwood and whaling in the mid-19th century and became the principal industry in the islands. The early Polynesian settlers to Hawaiʻi brought sugar cane with them and demonstrated that it could be grown successfully. In 1835, the first commercially-viable sugar plantation was started in Hawaiʻi at Koloa. Other plantations soon followed. Sugar was the dominant economic force in Hawaiʻi for over a century. Several sites found in this area highlight the historic past of the sugar economy. Koloa Plantation was the birthplace of the Hawaiian sugar industry. By 1883, more than 50 plantations were producing sugar on five islands. However, during this growth, a shortage of laborers to work in the growing sugar plantations became a challenge; the only answer was imported labor. It is not likely anyone then foresaw the impact this would have on the cultural and social structure of the islands. Starting in the 1850s, when the Hawaiian Legislature passed “An Act for the Governance of Masters and Servants,” labor shortages were eased by bringing in contract workers from Asia, Europe and North America. Sugar changed the social fabric of Hawai‘i. Of the nearly 385,000 workers that came, many thousands stayed to become a part of Hawai‘i’s unique ethnic mix. Hawai‘i continues to be one of the most culturally-diverse and racially-integrated places on the planet. Old Koloa Town grew up around the Plantation industry. Plantation workers not only labored, lived and shopped on the plantation, they also received medical care. Koloa’s buildings housed plantation stores, services and churches for these people, including Kauai’s first hotel. When Hawaiʻi became a US territory, at the turn of the century, it drew adventuresome cruise ship travelers in a tourism boom. Hotels blossomed. 1959 brought two significant actions that shaped the present day economic make-up of Hawai‘i, Statehood and jet-liner service between the mainland United States and Honolulu. These two events helped guide and expand the fledgling visitor industry. Tourism is the activity most responsible for Hawaiʻi’s recent economic status and standard of living. Koloa-Poʻipu hosts an organized, supportive Poʻipu Beach Resort Association that organizes and promotes destination marketing and promotion of visitor accommodations/activities on behalf of its membership. Poʻipu Beach coastal roads have visitor accommodations including hotels, condominium and vacation rental homes. The Visitor Industry remains the primary economic influence in the islands. 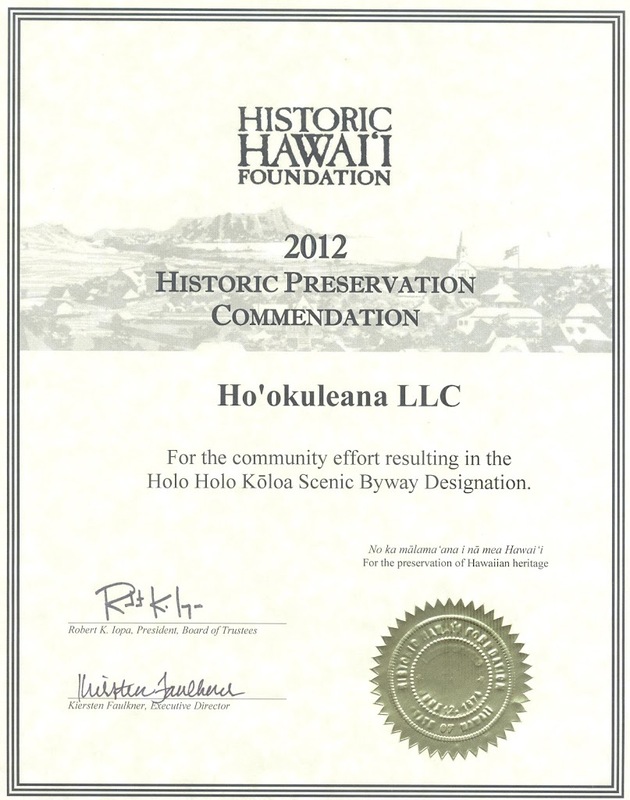 We prepared a corridor management plan for the Holo Holo Koloa Scenic Byway. We were honored and proud when the Plan received the Community-Based Planning Award from the American Planning Association‐Hawaiʻi Chapter and a Historic Preservation Commendation from Historic Hawaiʻi Foundation.